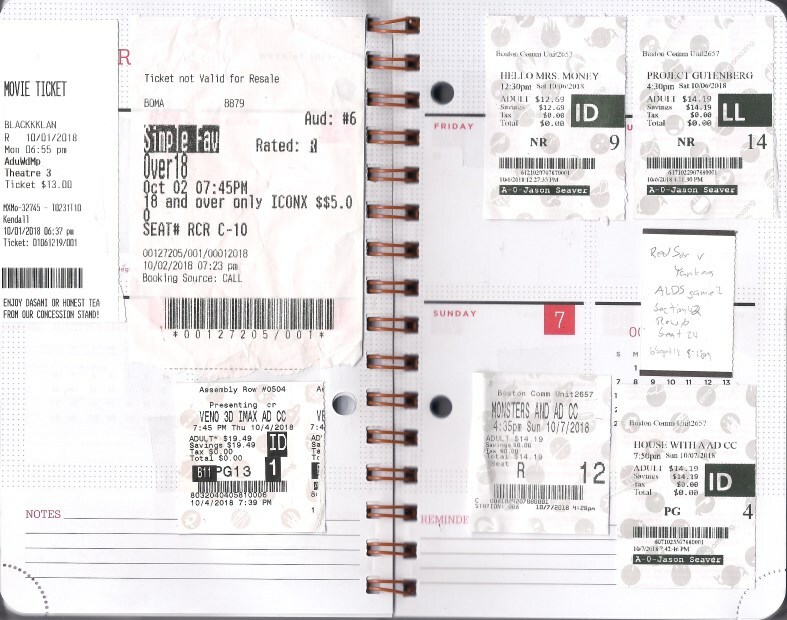 Averaging a movie a day even with playoff baseball going on, the sort of schedule that kind of makes my scrapbook grateful they didn't send my a physical ticket. It was a good week to catch up with some of the stuff that has been getting good reviews, starting with BlacKkKlansman, the new one from Spike Lee. I liked it quite a bit - not quite the live wire of Malcolm X (which played the Somerville's 70mm/Widescreen fest a week earlier), but covering a lot of the same territory and winding up another reminder that Lee is ambitious and with some art-house-y impulses but makes awfully entertaining movies. Tuesday night I was considering splurging for my birthday, and then the fancy theater goes and charges $5 a ticket for their deluxe screen. Not strictly necessary for A Simple Favor, which never really has a handle on how to be properly nuts. Also this week: A lot of Agile sprint planning at work, which meant a lot of time listening to other people talk on the phone - and on top of that, it got shifted to central time at the last minute, pushing the day an hour later, making it harder to get to certain things downtown. Fortunately for me, the Imax 3D preview of Venom was at a convenient time on Thursday and I kind of liked it. Not a good movie by any means, but fun. Friday night was for watching the first game of the ALDS on TV (win! ), which set Saturday up for a sort-of double feature of Chinese movies about faking something for greed: Hello, Mrs. Money and Project Gutenberg were both worth anticipating and catching, though a comedy from the Mahua troupe and a Chow Yun-fat action-thriller are an unusual pairing. It's not really a double feature if there's two hours between the end of one movie and the start of the next, I suppose, but that's how AMC scheduled it. Kind of a nuisance, that. The second let out just in time to get me to Fenway Park for Game 2, and, well, that one wasn't nearly as fun as Games 1 & 3 for a Red Sox fan (not going to jinx Game 4 as I watch it). Let's move on. I actually had a completely different plan for Sunday than what actually happened, planning on a double feature at the Coolidge, but when I made it to Park Street, the next C train was going to be 12 minutes and that doesn't get me to the theater on time, so I checked out what was playing nearby and decided to check out Monsters and Men, which got better on the train ride but wasn't necessarily grabbing me in the room. It was short enough that getting out to Brookline for Free Solo shouldn't have been an issue, but either they sold out screen #2 or I was confused about which movie was playing on what screen when, so I turned around and decided I might as well see something else, going for The House with a Clock in Its Walls, which is kind of a blast, though I don't know if my nieces would go for it, since it's actually scary at points. I am enjoying this run of Cate Blanchett having fun in big movies. Next week should be slower between baseball and a belated birthday party for my niece, but I'll be updating my Letterboxd when I do see something. Spike Lee does not have the patience for subtlety these days, if he ever did, and I wish more people were as entertaining when just laying it out there as he is. He makes this unlikely but based-on-actual-events story into a blend of police procedural and absurdist humor, because it almost has to be: Racists are dangerous and ridiculous in equal measure, and you can't confront them unless you acknowledge that. For all that he hammers this home in the plainest possible terms, there's something just as impressive about the way he takes his time in some ways. He lets people speak even when the speech could be compacted, and lets other scenes play out to get a sense of who people are when their guard is down. There's pure beauty to Ron and Patrice and a whole club not just dancing but singing along, casual and heartfelt community. He ties a century and a half of white supremacist violence together, but resists making it monolithic. He's got style but isn't showy this time around. It's interesting for me to see this just a week or so after Malcolm X, and not just because Lee was really smart to get Denzel Washington to clone himself right around that time so that Denzel 2.0 (going by the name "John David") can star in this one. There's a lot of the same thoughts kicking around both, and the flag motifs on the credits feel like bookends. Lee has maybe mellowed a bit in the intervening quarter-century, but he's still sharp and focused as anybody. Venom is a pretty dumb movie, but maybe it's just the right sort of stupid. It doesn't over-complicate things, and that's a strength more often than it's a weakness. It's weirder and funnier than it might have been, and seems self-aware without being too winky and silly. And it's got Tom Hardy, who may not be the surly Eddie Brock of the comics to the point where the characters basically just have the same name, but who makes this one a fairly likable loser and does some pretty darn good physical comedy. He's not necessarily as good as, say, Bruce Campbell or Jackie Chan doing the same sort of thing, but he'll remind you of them. It's not typical action/superhero material - and it's much more slaptick than this character usually given - but fits well with relatively modest ambitions and is always entertaining. Somewhere along the line, the filmmakers decided to play the symbiotes as being kind of goofy rather than just dark and badass, and that may not sit well with some fans (you can feel the movie steering away from its horror potential fairly often). It works for me, though, especially since the effects guys seem to be consciously referencing Todd Macfarlane's art style at times, and that tends to come across as exaggerated and over-noodly now even if it was the height of cool back in the 80s and 90s. That seems to be the filmmakers' approach throughout, recognizing just how quickly this style of comics became self-parody and maybe not leaning into it so hard that the fans feel attacked, but letting the silly stuff get a laugh. It's a bit of a mess, the sort of thing where it's almost certain that nobody involved really feels like they made the movie they wanted to make. It uses Michelle Williams too much and Jenny Slate too little, alternates delightfully goofy action sequences with others cut to ribbons trying to avoid an R rating. It's kind of entertaining anyway, somehow, and probably not in a way that could have been achieved deliberately. For all the jokes made about gorehound Eli Roth directing a kids' movie, The House with a Clock in Its Walls works as well as it does because he's not actually resisting all his horror-movie impulses as much as you might think. This thing has done genuinely creepy demons and disturbing moments, and that willingness to let his young audience have a nightmare or two is kind of terrific. A few genuine thrills are good for a kid, and I'm not sure anyone at a major Hollywood studio has really gone for it in this way since Something Wicked This Way Comes. But, don't misunderstand, this is still a very kid-friendly movie, with Jack Black Jack Blacking it up in every possible scene, CGI creatures that allow for the cleanest possible poop jokes, and charmingly goofy fantasy and slapstick. It's got a wonderfully dry Cate Blanchett who both classes the whole thing up and plays directly to the eight-year-old kids in the audience. It never gets scary or self-aware in a way that leaves the kids behind. It's a weird combination, enough that I may have to retire my jokes about what Takashi Miike directing kids' movies is like because a major studio has gone and done it, and rough in spots (Roth doesn't really know how to use effects for wonder as well as he does for action or scares). But it's fun, and things working when they really shouldn't only makes the more delightful.